I would like to thank everyone who supported Pelotonia 17. THANK YOU!!!!!!! On Saturday, I completed my goal of the 50 mile course from Columbus to New Albany thanks to the overwhelming support of friends and family. Thank you for all your encouragement and support!! This event raised over $15 Million toward cancer research with over 8,000 riders this year. 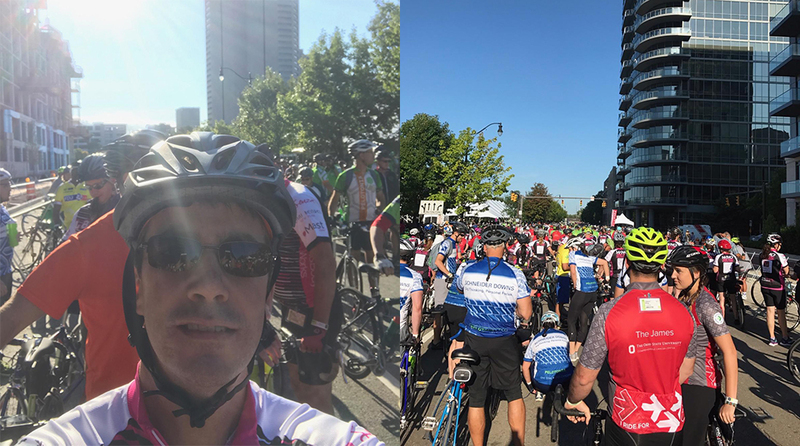 I did have high expectations for Pelotonia, but was completely amazed at how well organized it was and the hundreds of volunteers that made this possible. The 50 mile ride seemed like 25 as every 10-15 miles there were stops where sponsors provided riders with snacks and beverages to refuel, have a quick adjustment on their bike or use the bathroom if necessary. As this was my first Pelotonia, I trained hard and was prepared for the ride. I however, was not prepared for the emotions that I experienced as I passed thousands of people who lined the course cheering, encouraging and thanking each rider as they passed. Kids with their hands out “high fiving” riders as they passed. Many moms, dads, grandparents, grandchildren, aunts, uncles, nieces, nephews, sons, daughters, brothers, sisters, husbands, wives & friends held posters and pictures of their loved ones that have been affected by this heartless disease. Seeing all of these people, their hurt, their pictures, their stories, their lost ones, their survivors, their determination, their hope and their encouragement beat this disease, I put my head down, embraced any discomfort or fatigue I had– and I RODE! I rode and will continue to ride each year for #onegoal- to #endcancer!!!!! Thank you again for your generous contributions and support to make Pelotonia 17 such a success.